1 , 2 , 3 , 4 , 5 , 6 , 7 , 8 , 9 . This is the 9th list of thoughts that are supposed to be secret (May 1998) and for the time being the last one. When I do start a new serie I will make a link for that in this part on THIS place. Reproduction of this text is allowed provided that the text isn't changed, source is mentioned, and a copy of the magazine where the text is included in, is sent to TAM. 29-05-1998 : Just as these "secret thoughts about mail-art" come to an end, the mail-interviews take over again. Mail from Al (Blaster) Ackerman in which he sends his reactions to the concept text. The file is updated and already sent by e-mail into the (electronic) network. An e-mail from John Held Jr. using the account of his friend Chris. The last answer in this interview (actually the second part of the interview. The first part was when he lived in Dallas , TX , and the second part is during his first years in San Fransisco , CA). As I wrote before I heard already about the death of Buster Cleveland. Today I got some more information about his because Roy Arenella (34-39 72nd Street, Jackson Heights, NY 11372, USA), was so nice to send me a copy of the New York Times ORBITUARIES. 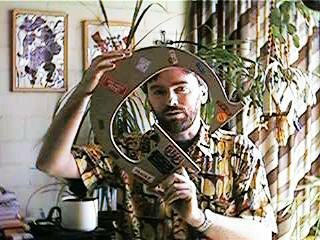 On May 25th 1998 they were published, and the article was quite large and has as title : Buster Cleveland, 55, Dada Artist Known for Collages and Mail Art. For those who don't know what Dada is all about just click on Dada and find an excellent text written by Perloff. 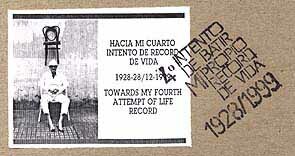 Dada and Fluxus are seen as the roots of mail art. Somewhere in the article it reads: "......Mr. Cleveland had long been involved with mail art, a medium pioneered by his friend, the late Ray Johnson. Quite interesting to read the complete article, which I am sure will be circulated inside the mail art network. Well, this is the last entry in this series of nine secret thoughts. I have had lots of reactions these last months, and I must say I did enjoy making these time-absorving documents. Now the "book" is ready, and it can be printed like one whole. I already have an offer for help to have the text printed in color. In that way I could even make a hard-copy version of the complete text. It sure has been a typical undertaking for the time we are in. All communications-forms come together and more and more the things get digital. 27-05-1998 : Archiving all that snail-mail isn't that easy, but at least it is something that can be done by just putting the things in boxes and portfolios. Archiving the electronic communication is something else. One of the new additions to my computer is a ZIP-drive. It is like a diskdrive, but the diskettes have 100 Mbyte of free space. Also the access-time of the diskettes is very fast, just like any harddisk. I am using this ZIP-drive now to backup all the texts and graphics I have made over the years. Some files originate from the 80-ies. The were once saved on 5,25 inch diskettes , copied onto 3,5 inch diskettes , and now I can put it all onto one ZIP-disk. Also the many images I have put online I can now easily backup. Most forget that the files constantly change, and that documenting these changes is not that easy. I like to print out the pages and send them into the snail mail art network. Another strange thing I sometimes do is make photos of the many pages (in colour) do document a specific status of the site. The way my site looks changes every week. New additions, new animated GIF's , which lateron are removed again (because they get boring and the DO take a lot of time to download). Ken Friedman reacted a few times on my homepage. He doesn't like all these moving parts on the screen. He likes a logic structure and easy access of information. He likes to use the Internet for the purpose is was made, exchange of data and information, access to information worldwide. Well, soon I will stop with these thoughts for a while. It doesn't mean that the site doesn't get updated, because that is something I do all the time. Examples are the file about PROMOTING the IUOMA , end I also just restructured the GUESTBOOK again. The entries in the guestbook are always funny to see. Some just say hi , some enter their projects , some leave their e-mail address and their URL-address. That makes it worth to save all those entries and make the files available for everybody. Don't forget to leave your message there as well. Entries can only be placed from the link that is made on the MAIN PAGE. It is also time to go further with the mail-interviews I am doing. I took a break for some months and devoted a lot of time to the internet. Yes, a pity, since the mail artists who do all this work can't send out these things for free. The money they get from the orders mostly goes back into the network...... To give you an idea of the stamps that are produced by The Ragged Edge Press I show you here one of the larger rubber stamps you can order in NY. Quite an unique style don't you think! This "Money and Mail Art don't mix" - thing has been around in the mail art network for a long time (started by Lon Spiegelman from California, USA). The purists in mail art take it really too seriously. If Vittore Baroni invests so much time, energy and money in the production of his books, together with Piermario Ciani. Why not support this good work and order one or more copies. The same goes for all those rubberstamp producers and zine-poducers. Making good things costs money and the truth is that nobody makes money on it; the people who do all the work just need some positive support to keep them going. And be honest. Don't you like to show your friends a good book which explains maybe a bit of what you are doing? 20-05-1998 : Finally I managed to convert the complete Thesis on mail art with the title Democratic art as a social sculpture writen by Michael Lumb (Flat 1 , 78 Orford Street , Ipswich , IP1 3PE , England) into HTML-documents. It is only the text which Michael sent me on diskette in ASCII-format. Unfortunatly the footnotes were not included, but the complete text of the THESIS is now available for you. It is a very interesting text of about 200 pages. Don't read it on the screen , but first print the content-part on paper. Then decide if you are interested , and just print or download the complete book to your place. This was the wish of Michael, to make the thesis available to the whole network. If you can print it, why not share it with friends. Michael worked a long time on this, and your reactions will surely be welcome! 19-05-1998 : There is still this discussion going on within the mail art network. Is the electronic communication also mail art or not? In the 36-pages booklet that Guy Bleus (P.O. Box 43 , 3830 Wellen , Belgium) published December 1997 (E-Pêle-Mêle Volume III , number I - also published as poster and e-mail zine!) one can read the different views. Some are conservative (it ain't no mail art if it isn't mailed through the mail-system) and others think everthing will soon be electronic. The group that does only the snail-mail. Mostly because they just don't have access to the Internet. Once one gets an access-point the changes are there. Using the electronic communication-forms is a learning-process that takes time. The group that communicates purely in electronic form. They produce only digital drawings , pages on the web , make links to other pages , play with video- and audio-files, computer-animations, etc. , and maybe print out the results. And then the group who sees the electronic forms as a new addition to the many communication-forms that there are for the mail artists. New ways need to be explored. I myself belong to this third group. I still am very active with the envelopes and do send them out every week still. The amount has just become a bit smaller due to the factors time, quality and money. I don't have that much time for the envelopes nowadays , and the postal rates - especially for foreign mail - have gone up year after year. The mail I do send out tends to be better (e.g. more time is spent on individual pieces). What I sometimes see in the mail artists from the first group is that they tend to keep on doing the same year after year. No development in their communication-forms. And that is a pity since the world is changing in a very fast way. 14-05-1998 : Mail from Tim Mancusi (153 Rancho Verde Cr. / Rohnert Park / CA 94928 USA) again. 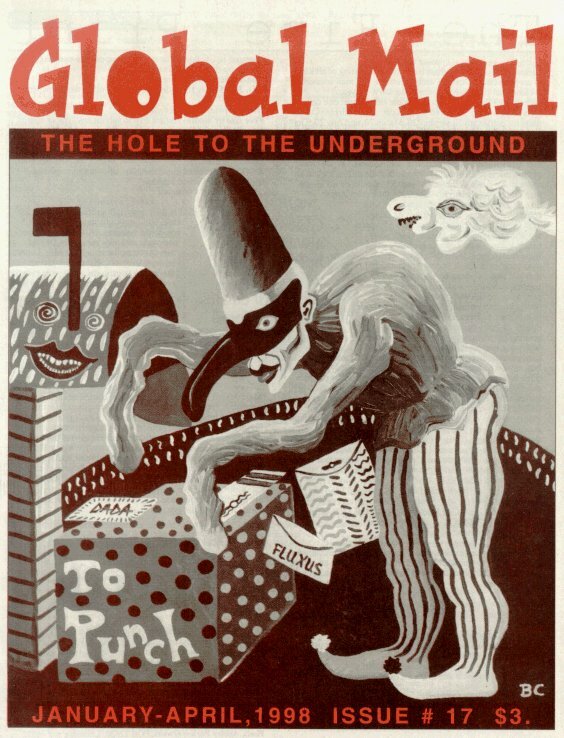 He sent me the cover of the new Global Mail #18 he designed. Some weeks ago I received via e-mail from Michael (the editor of the last 3 Global Mail's) the digital version of the cover of the last edition (with a painting by Barbara Cooper). The proof-version Tim sent me for GM #18 contains 9 portraits of Picasso Gaglione. An envelope passes by and the face gets distorted into a cyclone. Soon this May-August 1998 issue will be out and available for $3,00 . 13-05-1998 : Today , on this tropical day in the Netherlands (yes, it will be again 30 degrees Celsius today and it is only half in May! ), I collected my mail at the P.O. Box early. To my surprise there was no mail at all. Do the postal workers start late today......, did they deposite my mail in the wrong P.O.Box maybe? Because that happens sometimes as well? Who knows. It doesn't matter since I still have a lot to do. On the electronic front I receiced some interesting news. The site from SORA (JAPAN) is announced and I had a brief look. They start with a colourful image they got from Vigo (Argentina) which they split up in three parts. Each part gives access to a specific language (English , French and Japanese), so I immediately looked further. Yes, A site to explore for you, and do have a look for yourself. I have used some of their illustrations from Vigo on my own site now as well and have placed their link in the growing list of mail art sites. Artpool in Hungary is building a special section now on their site about mail-art. Their site is very interesting as well, with all that info of Fluxus , Ray Johnson, etc. It is not just a few pages, but a full site ready for researchers who look for information. That is interesting on the WWW. The sites get bigger and bigger, and there is just too many for a single person. From Vittore Baroni (Italy) I received an e-mail that he now started to work on a new book. This time bilangual (cooperation with John Held Jr. , Bill Gaglione and Piermario Ciani) and the subject rubber stamps. Will be an interesting book which will come out end of this year! 12-05-1998 : Browsing the net brings always surprises. On Hans Baumüller's site I discovered the logo which I enclose for you. It has a long history. The letter-lines are designed by Piermario Ciani from Italy. He made it in 1990 for the International Union of Mail Artists. Then - in the DNC - year 1992, he asked if he could use it for the layout in the congress-year paper-work. Of course , since logo's are often used and copied in the mail art net. Now Hans has found a new use for the logo. Two projects about crosses are currently going on. Hans Baumüller from Chile (currently living in Hamburg , Germany , see also the mail art link list!) and also Wilfried Nold (from Frankfurt/Main , Germany , editor of Numero) are both collecting crosses. 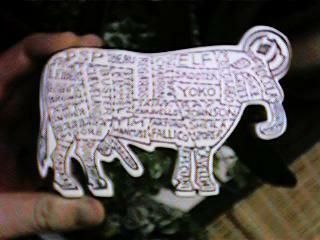 10-05-1998 : Since I was some days abroad, the mail art in my P.O. Box became a pile again which I collected a few days ago. What caught my eye immediately was the big G that Brano sent me. The Postal office had taken real good care of it (see photo) and it arrived unharmed. After the camera from some months ago again this unexpected item from Brano (address see secret thoughts # 7 where this is mentioned). Charles François reacted positive to the invitation to the mail-interview, and it will be the first and only interview of which you can see the progress online. Since Charles and I work in snail-mail and e-mail for a long time already we will see how it goes. The progress you can see in the file char-tam.html, which I will build and which file will be updated whenever there is a new addition to the interview. It is a nice experiment since all other interview were kept secret as there were held , and only when the results were there I would make them public. Still 25 interview are in progress this way, and in the coming years you will get to see those results as well. 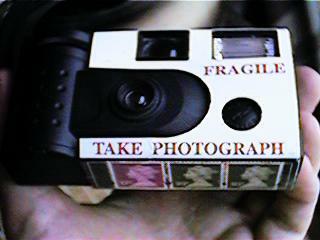 My brother took some more photos of mail-art items that I have here, so expect more visuals in the coming weeks online. One of them is the Bull-stamp that Rocola designed and sent to the people mentioned on the stamp. This is a historic item in mail-art, and I must say I was honered when I received this stamp. The funny detail was that Robert Rocola made a small error with my name. He called me Ruud Jansson instead of Janssen. But that makes the stamp even more funny. Does anybody know if more 'bulls' are online somewhere? I would be interested! With the e-mail of today some sad news. Mark Bloch informs me that Buster Cleveland has died on May 6th 1998. I was never in touch with him that often, but I have seen his name on several occasions. Some mail artists also suggested me I should interview him. That is now too late. 01-05-1998 : Yes, I have to think about what to do with these secret thoughts. It is now the 9th series and it has absorbed a lot of time. Since the summer-vacation is coming closer and I have to focus on other things as well , I have to decided to quite for a short time. There are ather things I want to put online for you as well , and maybe somebody else will start a online-serie. I noticed that Charles François started a kind of visual diary. But unlike me he decided to change the content every few days, and let the old infomation vanish. He has some specific ideas about the use of the new media, and as an exception I started a new interview with him. Not sure if he will accept the invitation, but I think it will be an interesting interview. Maybe we can do it so that you can follow the process (& text & visuals) of the interview while it proceeds. Soon you will find out! In principle these thoughts are online only. But maybe I might distribute some prints via snail-mail. You, as a reader, can do the same as well, and you are even encouraged to do so, or to publish these secrets. What more fun is there than publish secrets?